Now Hallowe’en has passed, I’ve been left with a lot of too many chocolate bars. There are only so many you can eat in a day so I tend to bake with them. This is one of my recipes which is a hit with adults and kids alike. The 4yo was a panic on All Hallow’s Eve rationing out the goodies at the door to the kids visiting to trick or treat. Normally, we get up to 100 or more visitors and while some families in the neighbourhood go to some effort by doing up bags of goodies I don’t have the time to be doing that. I had a big saucepan beside the door filled with lollipops and mini chocolate bars. The lollipops were on top and as he designated himself chief of the treats, each child got 1 precious lollipop and they were hard won too. Once the numbers had died off I checked the saucepan and realised I was left with nearly 50 mini-bars. They’re commonly known as “Milky Way” but I had invested this year in “Wild & Whippy”. Basically you’re talking a miniature bar of whipped nougat, coated in plain or milk chocolate. 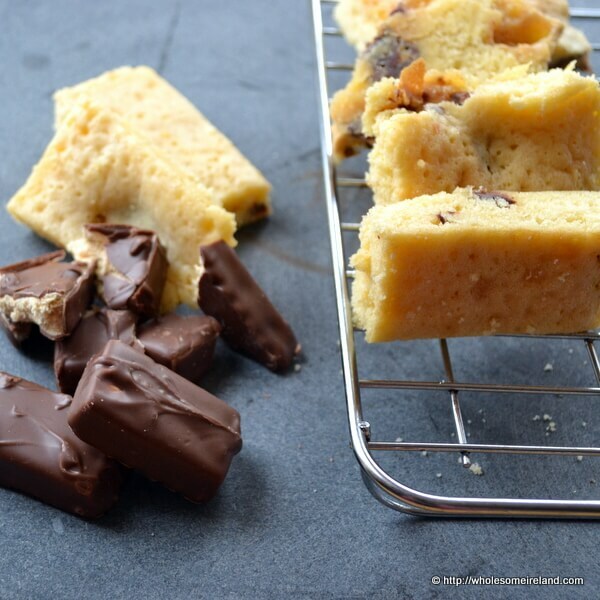 That kind of bar wouldn’t get comfortable in the back of the cupboard, while I’m not a fan of eating them I love them mixed into a light blondie batter. This recipe fills a 26cm x 26cm dish. You’ll get 16 large sized blondies out of the mixture, or more if you cut them smaller. The chocolate bar blondies do freeze if you have space in your freezer and are also delicious with a big spoon of plain vanilla ice cream. This recipe works with most mini bars or you could pour in some mini smarties, marshmallows etc. Put the butter, chocolate and vanilla extract into the heat proof bowl and put the bowl on top of the saucepan. Put the saucepan on the hob on a low setting. Don’t let the water boil and be careful it is scalding and dangerous! Let mixture in the heat proof bowl melt completely and then stir until the ingredients are combined together. Take the bowl off the hot saucepan carefully and leave to one side to cool slightly (10 minutes). Preheat the (fan) oven to 170 degrees Celcius. In the stand mixer, whisk the caster sugar and eggs until light and frothy. They’ll nearly double in size. While they’re whisking pull the chocolate bars into small pieces. You can chop them if you want to but there’s no need to be precise. Also line the baking dish with baking parchment. Pour the cooled butter and chocolate mixture into the whisked eggs and sugar. Stir well but don’t whisk. Sieve the flour into the wet ingredients and stir gently so as not to lose the air. Spoon the blondie mixture into the lined baking dish then dot with the pieces of chocolate bar. After 25 minutes remove & set to one side to completely cool before cutting and serving. ooooohhhhhh yum! this sounds fantastic! Because we all know that chocolate languishes in the back of the fridge in our houses Joanna…. I love blondies & sometimes think I even prefer them over brownies. 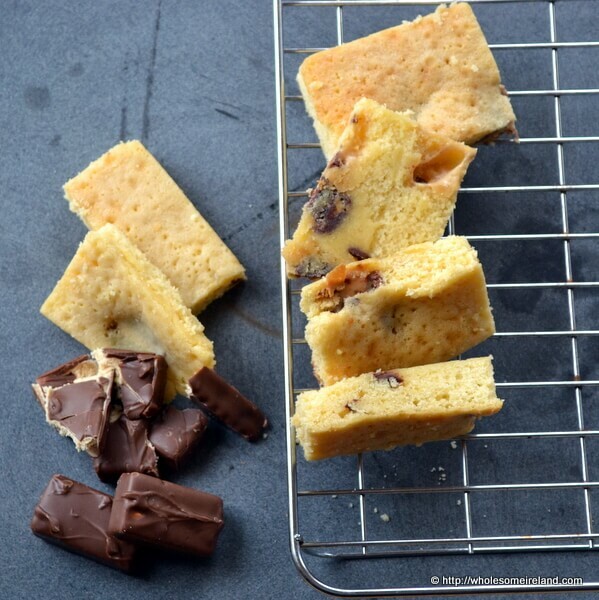 This sounds like a great way to use up leftover bars! Also lovely pics! Thanks Nessa, funnily himself prefers blondies over brownies as well!